When it comes to internal folding doors, even the best of us can get a little confused. What exactly is the difference between a folding sliding door and a bifolding door? What’s an access door and why do I need it? Here at Express Doors Direct, we decided it was about time to set the record straight. We explain what the differences really are, and how these doors function. Bi-folding doors are becoming increasingly popular choice for homeowners. They can be several metres in width, and are great for splitting larger rooms, or connecting smaller spaces. They are available in several different styles and configurations including single leaf and multiple panel. Read on to find out how each style works, and where you might install them. The smallest of the bifolding doors family. Often referred to as bifold or concertina, these doors are designed as an alternative to a standard internal door. The concertina door is made from two panels joined in the middle by hinges. Rather than swinging out in a full arc as a conventional internal door does, the concertina door folds in the middle and tucks against the wall. By folding in the centre, the amount of space required to open and close the door is reduced drastically, making it a great choice for areas of the home where space is limited. These single bifold doors are a popular choice for built-in wardrobes and closets; ensuite bathrooms, and separating living spaces from one another. If you want to maximise space without changing the actual architecture of your home, then these doors are a great solution. 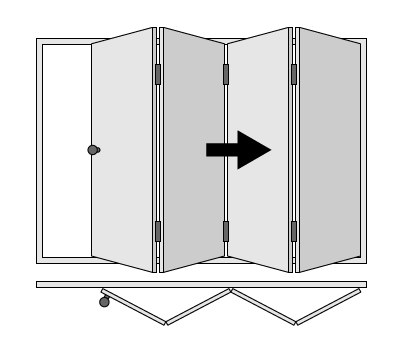 The name “bifold” suggests that there are two panels in action, however, it is possible to have doors with more than two panels. 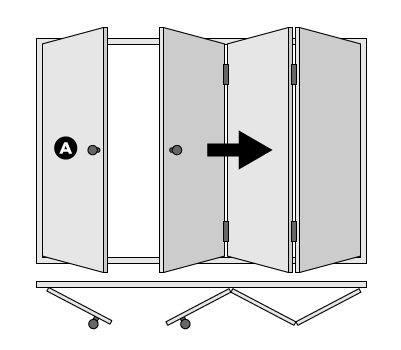 Even when there are seven or eight doors in a row, these will still be referred to as bifold doors. This is because they still open and close in the same folding, sliding, way. Here’s where things start to get a little tricky. This style of bifolding door can also be called Roomfold doors or folding sliding doors; but they all mean the same thing. Here at Express Doors Direct, we refer to them as interior bifold doors. Operating in the same way as the smaller single doors but on a larger scale. Bifolding door sets run along a track to prevent them from wobbling all over the place as you open and close them. The door panels fold back on one another and stack neatly against the wall. There are multiple ways that you can configure your interior bifold doors to open. For sets with an even number of panels, you may decide to have them open in the middle. For uneven numbers, many opt to take the doors to one side of the frame, or an access door might be added for day-to-day use. When considering your configuration, keep in mind the depth that the doors will stack to. Five doors all stacked on one another will have a deeper profile than two or three doors. An access door is typically found in larger configurations to make moving between the rooms in your home more convenient. 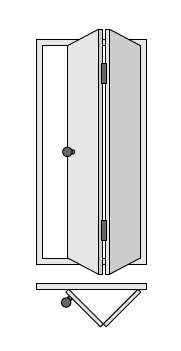 An access door functions in the same way that a standard internal door does. This leaf can open independently to the rest of the bifolding door set and allows you to make quickly and freely from room to room. The access door can be fitted either side of your opening and can be configured to open in your preferred direction.